Our goal is to help you grow your bottom line by applying behavioral science to your issues. Our method is to be curious, have fun, and to provide innovate insights. Let's use alchemy to make gold out of the materials available. It is no longer possible to ignore the role of the unconscious in our behaviors. Behavior is central to nearly every aspect of our lives from worklife to public safety to our personal lives. Behavior change is the key to making all of these aspects better. Working with companies and institutions, BehaviorAlchemy seeks to uncover and understand the roots of problems through a behavioral lens. This lens was developed by the UK Behavioural Insights team and it is called EAST. BehaviorAlchemy blends the best of experience, research and the challenges of the real world to make investments in behavior more effective. EAST is a methodology or lens for viewing issues from a behavioral perspective. 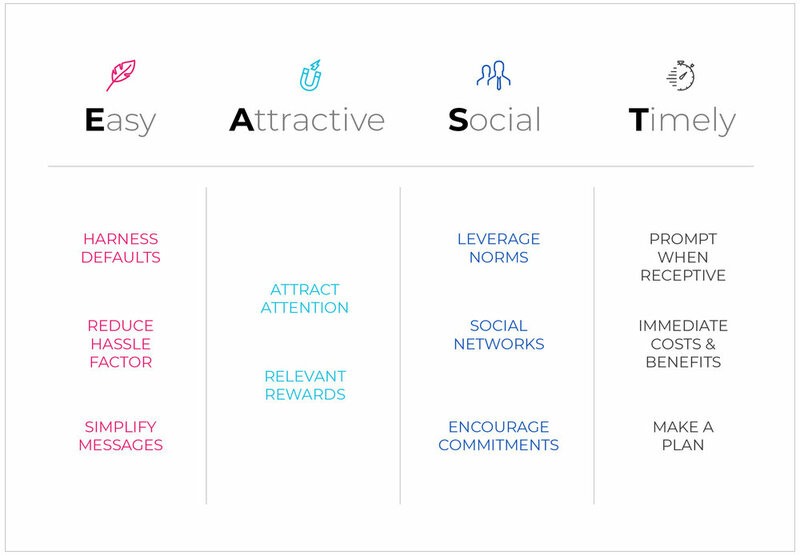 EAST was developed by the UK Insights Team under the leadership of Alain Samson, PhD to act as a simple tool for addressing situations where human behavior can be influenced in a positive way. There are three key elements in EASY that appeal to the way our brains process information. 1. Harness defaults. The best way to get someone to go along with you is to appeal to their defaults - whatever their status quo is. We also encounter defaults in our daily lives. The default way to donate your organs in case of being killed in a car accident in many countries is to not do anything. The default is that you are signed up to donate. 2. Reduce hassle factor. Similar to harnessing defaults, reducing the hassle factor to take action is a great way to get someone to do something. Hassles are barriers that deplete our interest and energy in completing tasks. Amazon's one-click ordering process is a great example of reducing the hassle factor. 3. Simplify messages. How lengthy and complex a set of instructions are make a difference in the likelihood to complete the task. IKEA has reduced the very difficult task of putting complex pieces of furniture together by using very simple images. No words. There are two key components to making something attractive. 1. Attract attention. We are drawn to and tend to remember things that are vivid. Think about it a recent vacation to a sunny beach destination. What stands out in your memory - walking through the grocery store to decide which flavor of Dorito's best suited your vacation needs or arriving at the beach for the first time? If the message is going to be internalized by the receiver, it needs to be attractive. 2. Relevant Rewards. Motivation can be stimulated by incentives and rewards. Whether it's choosing the shortest line at the supermarket (a reward of time) or signing up for a retail site's future promotions in exchange for a discount today, our behaviors are influenced by rewards. Most importantly, the rewards must be relevant. Although it seems intuitive, the application of relevant rewards is far from universal. Too often, companies forget that their employees are emotional and social beings and that they are not coin-operated automatons. For firms trying to build employee engagement, 'more money' is not the answer. 1. Leverage Norms. Whenever possible, the social norms that are relevant to the target audience should be exploited. Assumptions about social norms may not be effective in this context, also. A superior means of identifying social norms with an audience is to study them. It's not enough to survey upper-middle-class homeowners about their intention to reduce energy consumption because they all indicate they're knowledgeable and well-intended. What is more effective is to publish their neighborhood's average energy consumption with each month's energy bill. Humans have a tendency to avoid extremes and bringing the social norms to the forefront of our attention nudge our decision making. 2. Social Networks. At a very basic level, humans are tribal. We connect ourselves to different social networks (tribes) for different purposes. Our church group and our political affiliations may be similar, but not identical. Our work tribe (vocation) is likely to be different from the tribes relevant to our avocations. Leveraging the appropriate network can be a powerful influencer in behavior change. 3. Encourage Commitment. Because our futures are nearly infinitely malleable, it's easy to change up our plans and rationalize our decision, especially if no commitment is involved. We are much more likely to follow through on a pledged action if a commitment is made and the best commitments are voluntary. 1. Prompt When Receptive. Sales managers oftentimes want to drive more sales during traditionally slow periods. One must ask if there are good reasons for traditionally slow periods happening the way they do and oftentimes the answer is legitimate upticks and downturns in the market. Sales incentives to sell more during slow periods when the market (and the reps) are not receptive is wasteful both of human energy and financial resources. Higher success comes when the market is primed to buy (sales on farm equipment at the state fair) and the sales organization can be nudged to do more. 2. Immediate Costs & Benefits. Because the future is such an amorphous thing in our minds, it's easier to make decisions based on what's happening NOW. The present is concrete and we value the present much higher than we value the future - the decision to have one more beer has little to do with how we'll feel tomorrow morning. By framing potential future impact of decisions as having immediate and present-time costs and benefits, decisions can be made more clearly. 3. Make a Plan. When the desired actions are relying on future behaviors, the best way to follow-through is to have a plan (and, of course, commitment to that plan). Planning helps bring the vague future into the concrete present in a way that helps us make more relevant decisions. A plan will help make the behavior change more timely.